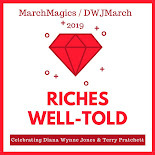 We Be Reading: #DWJMarch: GIVEAWAY DAY! Thank you to everyone who has been participating so far in DWJ March! I hope that you have enjoyed any books that you have picked up already or that you have gotten some ideas of which of her books might be a good fit for you. I want to help get a book (or two) into circulation so here's my giveaway. Just fill out the form below and I will choose a winner at the end of the month. Book(s) will be ordered from a retailer based on your location. You know I am always up for getting more DWJ books in my hands. I can't host a giveaway this year, but next year you can count on me! !